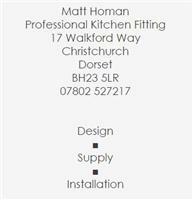 Matthew Homan - Carpenter, Kitchens based in Walkford, Dorset. Welcome to my Checkatrade page, my name is Matt and I am based in Christchurch and cover the surrounding areas including Bournemouth, Wimbourne, Lymington and Ferndown. Carpentry and Bespoke kitchens/furniture have been a passion of mine for many years and I have over 33years experience, 20 of which have been in Kitchen fitting and design. I have many customers who have all been through recommendation and word of mouth and I’m looking to build on this with Checkatrade feedback which is already growing. I pride myself on my service including getting back to your enquiry within 24hrs, I am not VAT registered saving you money and offer friendly advice and free estimates. I am able to offer a complete service from start to finish, giving you peace of mind. Please give me a call on 07802 527217. I look forward to your call.